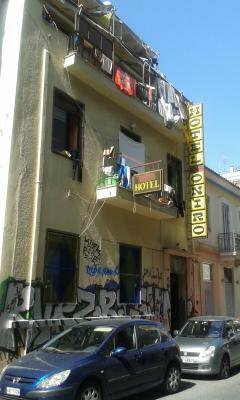 Hotel “Oniro” is a better option for a fugitive life away from homelessness and another decent station for some Syrian refugees in Greece. Hotel "Oniro" (Photo: Qusay Loubani)After hundreds of refugees turned their backs on Idomeni, totally disillusioned due to the closed borders and the evacuated wild camp, many of them headed to the Athenian harbour of Piraeus, favouring a place on the dockside, in the unbearable blazing heat of June within the view of the tourist liners to other places. Frankly, many of us had no other place to go to anyway. Since life in a tent near the docks in another wild camp was not to be regarded as a picnic, and since harbours are not built to accommodate fugitives in rising numbers, some Left-wing Greek activists decided to help us look for a solution, and they made a good find: The Oniro hotel. A hotel at a 500 metre distance to the Victoria underground station at the centre of Athens, that has been closed due to tax debts for about four years now. The hotel was “re-opened“ after a five-hour-march starting at the Omonia Square, that was arranged by the Greek activists and naturally accompanied by many refugees. 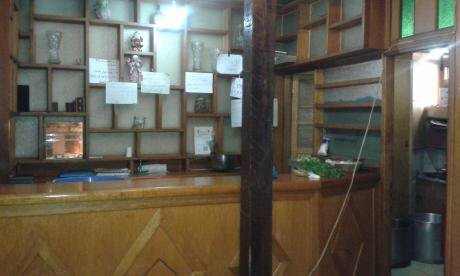 Arriving to our desired destination, both refugees and activists entered the hotel forcibly. Many of us set ourselves up in one of the empty rooms with a big sign of astonishment. We’d had suspicions that the whole action wouldn’t lead to anything at all. The building was somehow abandoned but it had all the necessary simple, but comfortable furniture and each room had its own bath. For every one of us the latter was a dream come true! The long lines at the refugee camps seemed all of a sudden like an almost forgotten nightmare compared to the new situation of total independence by using a bath. About 200 – 250 refugees are staying here now. As in other occupied camps in Athens, the meals for the inhabitants are prepared in the hotel while some of us, supported by Greek and foreign volunteers, take care of getting the supplies. Other volunteers took it upon themselves to bring some smiles and laughs to the faces of the children by gathering them at the hotel lobby and always surprising them with some new games or some new toys. Gradually, tiny numbers of fugitives seeking a solution to their tramping through the streets of Athens are knocking on Oniro's doors, hoping to get some of the luck that other refugees have had. After the hotel committee of managing activists check out their humanitarian conditions and the reliability of their statements, some of them are allowed to stay in a room or a facility at the hotel, which is prepared to cater for their needs. Noticing that only a small number of us can be met with a kind reception at the Oniro for lack of space, each case is being handled in accordance with certain eligibility criteria designed to decide who can find a place to stay and also how this place is divided among the residents. Three single men for example staying in a big room had to make place for two more single men who were admitted recently. Another big family staying in two small rooms had to leave making place for two smaller families there, but moving to a big single room which became free, as a childless couple had to take a smaller room. People also leave the hotel, on the other hand, because they get their desired residence permit through the resettlement program or because they cause problems in the hotel and/or can't integrate themselves into the environment of our very calm Greek neighbours. Such disturbances are immediately avenged by the hotel committee which is trying by all available means to keep the calmness in the place, to ensure the continuation of the place itself and to avoid all kinds of problems that could endanger the existence of this small, illegal refugee paradise. The list of priorities is clear to see for everyone in the reception hall and the tasks to be carried out are equally assigned to the inhabitants, keeping the place always clean and in a tidy state. A meeting gathering residents and volunteers is also held once a week to discuss basic services like kitchen, pharmacy and the depot of basic supplies in addition to other services that could be provided depending on their availability. The time factor at the Oniro is not that deadly. At the centre of Athens, any resident here can walk around sighting many ancient Greek monuments, visiting some museums or spending some nice time in one of the many parks; all are ideally in reach, unlike for other refugees who are staying in camps in the most remote corners of Greece. Although they too are allowed to leave the camps and travel around, they think twice before they try it through the very fact that the extreme distances makes it a hard and expensive thing to do. "The ambition is not to stay here! The comfort in this place is only temporary! Our first and last goal remains to get out of Greece any way we can and to start a realistic new life”, expresses another resident. He is annoyed about the agonizingly slow resettlement program. Showing us an Arabic article on his smart phone about this program he quotes literally that “the EU is very annoyed about the disharmonious performance of the Greek government concerning the resettlement program, specially not keeping the agreed time lines to relocate the asylum seekers. Athens on the other hand makes the EU accountable for these delays by not handling the situation in a serious manner and not achieving the cofactors needed for a swift registration”. Indeed, this matter is going to last a very long time. Those who want to reunite with their relatives that already live somewhere in Europe have the biggest problem of all. They have to wait up to 12-18 months for a family reunion, if the concerned country approves it at all and the majority of the Oniro residents are waiting for such an answer to their reunion applications. Nevertheless, they handle the circumstances they are facing very logically and this logic, including the help of the volunteers of course, has allowed us to arrange a place to stay for a long period of time without any help from any official authorities. At the very least, we are now staying in a place that is worthy of sheltering and protecting us. Us, the rest of humanity politicians still call their own. Read Qusay Loubani's previous articles tracking his journey through Europe: Idomeni: a devil's game and From the border to the harbour: the Greek tragecy goes on.